Look, I know you think you're a brilliant joke-teller and all, but that seal, Man, she'll laugh at anything. Rosie W.! It tickles! It TICKLES!!!! !AAAAAAAAAHHHHHStop eet! She kind of looks like she's just humoring the joke-teller. She's coming off as a bit sarcastic. 1. Your comment is definitely ROFL-worthy. 2. Your screenname is even better. Should've known something that clever would come from T[Ed.]! I used to think seals were cute ... until I saw one eat a penguin. So harsh, Jessica. A boyfriend once broke up with me using the same line: I thought you were cute until I saw you eat a penguin. Not my fault I eat penguins--it's in my genes. is this the seal of approval? I can smellz the fish on her breff... but shes vurry qte... Luuuuurvez da seel..
Why do Pilgrims' pants always fall down? Because they have their buckles on their hats! or the knowledge that seals floss. 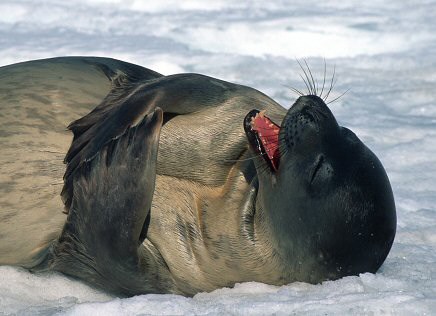 This seal is also constantly high, so the laugh doesn't really count. (Small amounts are legal in Alaska). Donkeh, nem calling iz nawt nyce. And stawp singing! I would totally vote for this seal. This seal makes me smile. I think it is tewtelly the CO Seal of Approval, pheas. Nice work on the hover, Teho. I wish this seal would tell me the punchline to the Aristocrats because I've never heard it. Happy Noooo Year Meggiweg!! You're on top form! The sealio! The horseh cap-shons! Just got back, not feenished catching up. My oscar for 2007 goes to Mom and bebeh calico kittehs - the licking, the flailing tineh helpless pawpads! ***Meltdown*** Yay for another year of much needed cute and sillehness! Lurker -- I didn't do this one! It was all Meg. I actually had to Google the reference! MaggieBelle--The punchline IS "the Aristocrats"! (the set-up is the booking agent asks the family of performers what they do in their act, they then describe all kinds of debauchery. Then the agent says "What do you call yourselves?" or, variably, "What's the name of the act?" I bet that's the cleanest telling, EVAR!!!!! Poohbear, is Teho bein' a donkeh (heehee) in other posts too? Gail - Ahh...I see. I saw that documentary they did on HBO about that joke, but I never did get it. Wow. I am going to interrupt this hilarious comment thread to say that this is the funniest comment thread I've read in a while. Cute patootie Seal looks like it's sunbathing ^^ The face of a happy seal enjoying the sun. Me thinks the seal is laughing at the LOLCat Bible. Of course Silent Meow is not my real name! LOL! And, Silent Meow is really not silent at all. It's more like this: Be silent! Meow! Ok, Amy. Since you know that Silent Meow is not my real name, who am I? While Amy guesses who I am, I am going to go haz me a cheeseburger. Bee back later to check on dis. I think the seal is watching "Monty Python and the Holy Grail." We eat de-lish fish and dish a lot. But we have to look up words a looooooot. To find food for the table. We push the envelope alot." Aubrey! your song makes me clap my flippers and say ark ark ark! Seals with dictionaries, looking up words a lot! Bwah! Aubrey! That is brilliant, even for you. Aubrey, somewhere Graham Chapman is smiling. Bravo! To me Madamoiselle Seal looks like a bored debutante at a ball trying to look happy!